Abstract. The aim of the present paper were to determine compressibility behaviour of post-compacts depending on compaction pressure for the materials obtained in laboratory that contain metallized netting like reinforcement material and powdery nanocarbon as filling agent . Determination of polymeric composite on basis of silicone rubber with additions like nanocarbon with 20 wt.% nanocarbon , powder mixtures’ compressibility was performed in mechanical testing machine for static materials, LFM model , Walter & Sai AG Switzerland at pressures 30kN. Determining the characteristics of material was based on the regression analysis . Modulus of elasticity of the test samples was determined appropriate range 0,1 ÷ 0,3% deformation, corresponding to the maximum correlation coefficient derived from regression of the experimental data. The synthetic polymeric matrix used at the obtaining composite films is represented by a bicomponent silicone elastomer that strengthens itself at the room temperature by means of a poly condensation reaction. The paper shows up the research results on processing and characterization of composite materials with polymeric matrix (silicone rubber). Abstract. Cold fusion, the Higgs boson ... are some of the major goals of modern science, scientific aspirations who are dedicated to hard work, that makes them contemporary equivalents of the Philosopher's stone and the elixir of long life, which the old alchemists strove so earnestly to know. Amongst these contemporary "philosopher stones" is the artificial photosynthesis - reproduction in the laboratory - and then industrial scale, it is hoped - the miracle process, which for billions of years has enriched the Earth's atmosphere with oxygen and creates - from water, carbon and light - organic substances in thousands of diverse types and sustains the planet’s life. Abstract. The purpose of this paper is to show the results obtained during chemical investigations of chalk stone materials and their consolidation attempts by using hydroxyapatite (HAp) and strontium hydroxyapatite (SrHAp) nanomaterials. Abstract. Researches on the influence of structure and hardness of the flame retardant of polymeric materials have been made over the years to such material combination from the simple to the complex. It is known that in order to improve fire resistance in raw material composition introducing flame retardants. In this paper we propose to determine the behaviour of the gradual introduction of Reogard 2000® flame retardant polymer material structure - Polypropylene, causing hardness fireproof polypropylene with Reogard 2000®. The method of determination is - method Shore D. Tests was made on various samples of polypropylene with concentrations of 5%, 10%, 15%, 20%, 25% Reogard 2000®. Abstract. Energy and environmental diagnosis consists in analysis of the operation, in current conditions and after upgrading of boiler and furnace equipments, based on energy balance and emission of pollutants in real and optimized conditions, where parameters after upgrading are determined by simulating operation using appropriate software. The paper describes the algorithm of energy and environmental diagnosis software and its application in upgrading of heating furnace. Abstract. Phthalocyanine derivatives are of increasing technological relevance due to their photophysical properties.Though silicon phthalocyanines bearing a different number of fused benzo-moieties are spectroscopically well investigated in solution, a complete spectroscopic characterization of their properties is not available, yet. To learn more about the influence of the silicon-metal in the benzo-annelated extended pi-system, we systematically investigated the spectroscopic and photodynamic properties of 2,9,16,23-tetra-tert-butyl-29H,31Hphthalocyanine dihydroxide (OH)2Si-tBuPc). Since the centre of the phthalocyanine ligand is coordinated with silicon central metal ion, the electronic states are of both silicon and ligand origin. As a consequence the monomers of these compounds have a good absorbance than their metal-centered compounds. In addition, to mimic strong interaction between molecules, we investigated dimers/aggregates of the compound. Abstract. The estimation of the apparent average size of sub-grain domains is important to underline the mechanical and electrical properties of metallic materials. Further, the size estimations of the sub-grain domains can be used to calculate the dislocation densities of the measured samples. Subsequently, the size and dislocation density provides a thoroughly understanding of the steels physical properties variation. In the paper are presented the values of the measurands and their measurement uncertainties estimated according with SR EN 98-3:2010 standard and error propagation low. There were considered two types of quenched steels: 316L stainless steel and 100Cr5 bearing steel. Abstract. This paper has as fundamental purpose the theoretic and practical presentation and explanation of the way to determine the retained austenite content. Is presented the chosen experimental method and technique – the estimation method of the residual austenite content using the DRON 3 diffractometer. The used procedure: after processing and indexing the difractogrames was determined the residual austenite content following the pairs of iron lines: a (110) and ? (111) and a (211) and ? (311), reaching the conclusion that the samples investigated by X-ray diffraction contain residual austenite between 2,8 % minimum calculated value and 4,9% maximum calculated value. Abstract. In the paper we present in comparison hardness and electrical conductivity of copper cast ingot (I/M) and sintered copper (P/M) with Cu-Ag5 alloys (I/M and P/M) subjected to the same treatment. Abstract. In the paper are shown some wide hysteresis shape memory alloys from Cu-Zn-Al system and Ni-Ti based alloys and their applications starting from increasing the hysteresis of the alloys or more precisely by separating austenite start temperature (As) from martensite start temperature (Ms) as far as it is possible. Abstract. The superparamagnetic elastomers (which contain the magnetic 10 nm nanoparticles in size) are a new class of composite elastic material having controlled properties into magnetic field. This paper presents an artificial muscle obtained using common precursors (magnetite obtained in the laboratory, silicone rubber). The performance objectives was achieved a composite material with elastic properties that recommend it as being useful for making small magnetic muscle. Abstract. This work presents an evaluation model of the Brinell hardness test, with an approach a Stochastic processes. Hardness evaluation is one of the most important and commonly used methods for material or product testing. For better understand the preparation of samples for testing hardness, we try to describe the steps leading up to training samples test, to evaluate them using stochastic processes. In this case we built a characteristic stochastic process with discreet times and for that one we made some calculation using real data observed in laboratory tests. It may be that these results can improve the financial and economic evaluations to reduce cost expenses. Abstract. The hip joint is a ball joint with three freedom degrees (characterizing rotations around the three axes of a Cartesian system), which can theoretically be controlled only by six muscles. In reality, the mobility of the joints is controlled by 22 muscles, most of whom wear material with multiple functions, which requires improved tribological performance through constructive changes and even the principle of operation. The strain relief can be achieved by increasing the durability of the materials constituting the prosthetic components, a different surface chemistry in order to reduce friction between adhesive components. This paper presents morphological studies of nanoparticle layers deposited on the surface of hip prostheses by AFM microscopy. Abstract. The aging of a material exposed to any medium may take a few aspects. They have an overall impact on the evolution of its mechanical properties. The individual effect of each quantization allows to highlight the major factor of degradation of the medium. This study proposes a correlation between the influence of exposure to an aqueous medium and mechanical cycling on the elastic modulus of a glass-epoxy composite. Abstract. This paper presents a real situation in which a manufacturer of parts used in the car industry has tried to honor an order coming from a customer by optimizing the total cost of producing output. Based on the analyzes performed on the two categories of cost components, it can be concluded that just obtain a reduction from the total cost of raw material optimization. Abstract. In the second part of the paper will present the effect of changing a characteristic of the initial work piece on the total cost of the production and thus obtaining the economic efficiency of the process. For obtaining optimized version of work piece studies, the final length of the work piece perform allows use without affecting its final destination at the same time, but will et reduction in the mass of raw material used and ultimately a reduction in total cost of raw material, which will be reflected in lowering the total cost of obtaining the production of parts. Abstract. Some results of the investigation of factors influencing the roughness of turned surfaces are presented in the paper. The main parameters affecting the surface roughness of machined sourfaces are: cutting speed, feed and axial depth of cut. By choosing different cutting regimes in finishing turning on a cnc lathe, it was investigated the variation of the surfaces roughness. Abstract. The dynamic stresses occur in a coupling between the motor shaft and the equipment is due to vibration in dynamic applications (with inertial shock or accidental loads) and they are overloading to the normal service stresses, leading to values greater than the maximum allowable limit. Thus, in order to take into account their effect, an coefficient ks must be considered. In the case of dynamic system such as shafts and wheels, start at constant torque load, occurring important torsional vibration coupling lead to dynamic torsional torque Mtd respectively dynamic shear stress Td, enough to be taken into account. This paper presents the calculation of dynamic torsioanal torque and influence of mass parameters (inertia) and the torsional stiffness of the shaft corresponding to starting from constant torque. Abstract. The stresses in a coupling shaft between the engine and the equipment is due to vibration in dynamic loads and overlapping operating stresses corresponding normal working regime. These stresses have values that sometimes exceed the allowable stresses. At constant torque load start in coupling shaft occurring torsional vibration stresses due to dynamic torsional torque Mtd. This paper shows how simulate with MATLAB SIMULINK program the dynamic response when starting from a echipamet with constant and linear torque and the influence of time variation of torque from zero to the maximum value of the dynamic response and torsional vibrations of the shaft and the clutch when starting under load. Abstract. Wear is defined as the process of destruction of the superficial layer of a sliding coupling in a small volume of material, that leads to the occurence of wear particle. The mechanism of wear particle formation depends to a great extent on the deformation state in the contact area (elastic, plastic, elasto-plastic), on the nature of the material (breaking tenssion, flowing tenssion etc) and on the working conditions (pressure, velocity, temperature etc). The harder material, may be elastically or plastically distorted, thus changing the state of the conjugate surface, function on the maximum deformation on the friction surface, on the angle and the geometry of asperity (or abrasive particles). The paper proposes both an analysis of the way the materials behave under the action of a sliding coupling, for materials with different hardnesses and the drawing up of some maps in order to establish the frictional and wear behaviour of a sliding coupling function on the above-mentioned parameters, thus, the processing, loading and lubrication conditions that might influence the good working of the sliding coupling may be avoided. Abstract. This paper aims to solve some reductions that are part of the ventilation and conditioning installations, whose routes are subject to limited space and possibilities of installation. The drawing unfoldings and cutting sheets to obtain the bending operations and combining of parts or subassemblies of complex form, is a common application met in industry.The graphical solving of the problems of technical representation has enabled the formation of abstract geometric of the pieces forms and the ability to see into space. The paper proposes to establish the unfolding of a connection, used in the industrial equipments, by the classical method of the descriptive geometry and mathematics, using appropriate software. Abstract. The paper aims to present the dynamic survey of elastic motions which are superposed to rigid movements that occur in a mechanical system consisting of two rigid solids. For this we will write the equations of motion for each rigid solid which is considered to be free and then we will write the differential equations which describe the motion of each rigid solid in the presence of active and constraint forces which are considered to be unknown. Constraint forces will then be eliminated from the differential equations system considering the geometrical constraints which are imposed by the link. Abstract. In positioning measurement techniques are a lot of diverse methods at macro and micro scales for extracting coordinates. The image processing represents in actuality a large field of innovative new systems. The actual positioning systems included into automation equipments are based on a series of transducers that are connected directly to execution elements of mechanisms. The present idea refers to a bi-dimensional working space that need by two coordinates for positioning determination. The planar space becomes an informational support that is video interpreted by a special image processing system and this system connects the absolute coordinates of an absolute origin to all objects existing into visual field trough informational entities similar with milestone. In this paperwork the authors present the principle and some results obtained into experimental system functioning. Abstract. Bone reconstruction can be customized for every patient with minimum effort and in safety because of the great possibility of computing CT files of DICOM type and transforming data in STL and CAD files that can be visualized and manipulated in 3D. As a plus, the strains and stresses could be simulated through FEM/CFD (Finite Element Analysis/Computer Fluid Dynamics). Thus, the surgeon and the engineer have a real time image of the future implant even before implantation and they can do some vital individualised adjustments to improve it.Building time for a standard implant could be between 2-10 hours, so every geometric shape, even with a very high degree of complexity could be delivered next day after design confirmation. Then, the implant could be mechanically tested, both static and dinamic, and after results, the mechanical properties of the implant can be improved by the manipulation of laser exposure. Abstract. Communication between the various mechatronic systems is a way to transmit information from one device to another through standardized communication protocols. Standardized communication has enabled the development of mechatronic systems in various fields in the area of the quality control by interconnecting various equipment in the complex architectures dimensional control and measurement for different parts. Was made various mechatronic systems having architectures that combine various elements necessary for the control and measurement of the dimensions parts. Abstract. This paper, based on the descriptive and analytical geometry, shows the trace elements of the unfoldings various intersections of geometric corps, the mathematical relations of calculation, necessary to determine some characteristic points. The paper presents some considerations on the theory of unfolding a pyramidal surface intersected with a cylinder surface, and the cylindrical surfaces intersections, using the descriptive geometry and mathematical approach of the problem. As an application, the dimensions of the surfaces are known. Abstract. Design, fabrication and tests of a compliant flexure based microgripper were performed. The bending force is applied by using a mixt interaction between two solenoids and two permanent magnets rigid fixed on cantilevers. Micromanipulation tests were conducted in order to confirm the mathematical model developed for device simulation The simulation and experimental data are in a good agreement and have proven accuracy of device control system. Abstract. The paper aims to present a numerical method used to study the dynamic of a rigid solid which describes a plan-parallel motion subjected to links. We will first establish the equations of motion for the rigid solid considered to be free and then we will write the differential equations describing the motion of the rigid solid considering the connection forces that are considerec unknown. The connection forces are then removed from the system of differential equations taking into account the geometrical constraints imposed by the link. Abstract. 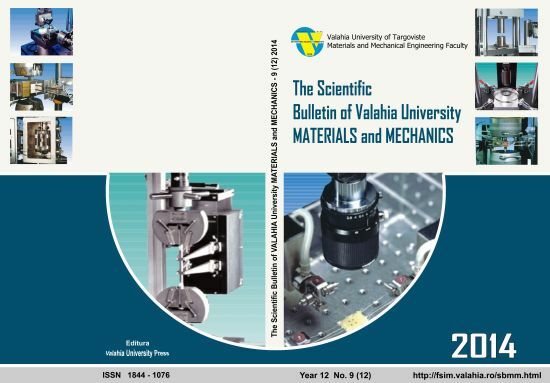 This paper presents the design and construction of a mechatronic system with high precision photoelectric incremental sensor for mini-dimensional measuring, system that underlies the construction of mechatronic and adaptronics equipments used for high precision measurement of linear movements. Abstract. In order to carry out implants’ fatigue tests under physiologic loading conditions, it is required to know the forces acting on the hip joint. A wear testing machine which is able to test the actual prostheses is called a hip simulator. Over the years various researches on various kinds of simulators and implants have been performed. The goal of this paper is to present a few versions of hip simulators along with an experimental stand version of our own design, to test the friction torque on the femoral head of a hip prosthesis, which allows simulating the main movements occurring in the hip joint, i.e. flexion-extension, internal rotation - external rotation, microseparation movement. Abstract. In this paper there are presented two constructive aspects of a novel tracked mini caterpillar autonomous robot for patrol and inspection. There are analyzed the resistant forces that appear when the robot navigates on a tilt plane and also the resistant forces on each track when the robot is performing a curbed motion. Abstract. The paper analyzes theoretically the elements conditioning the performance of the manual oxygen and acetylene-based cutting equipment and presents original proposals for performance improvement after verification on the test stand. Abstract. The creactivity of human being correlated with the requirements of permanent increase of the living standard, constitutes the basis of society development. In a perfect world or in an integrant production environment, the 3D measurement systems, by providing the quality control integrated in the production line would be able to measure all the necessary parameters in a single step, without errors and render the results in the same way to the manufacturing networks with computers, in formats useful for CNC machines control and processes management. Progressive replacement of traditional tools with intelligent technological equipment becoming more complex is one of the most important aspects of the development of production processes in all industrial fields. Because the automotive industry is one of the most important industries in the world, manufacturing systems engineering, control methods and techniques, and assurance of quality, present particular interest by the economic results, in particular the reduction of working time and production costs. Intelligent measurement and integrated dimensional control are needed to ensure the quality of the product or industrial manufacturing process. Abstract. Reliability is a feature that creates trust and confidence in a product design and gives a determining role in the constructive solutions. Due to the particular importance of reliability in recent years manufacturers have been obliged to specify information about the parameters of reliability and maintenance program when they deliver products to customers . If the manufacturing reliability may decrease due to technological deviations or exceptions to construction documentation, operational reliability can occur at the project level only if they respect relevant maintenance program design. The reliability may decrease if the operating instructions are not followed, adapted to the conditions of use, which may differ from one point in the life of the equipment of those originally considered basic or conceptual conditions. In this paper the concept of mentanance program designed to increase the reliability of mechanical energy and petrochemical industry is highlited.